At AWS, we believe the future of tech should include people of every color, gender, belief, origin, and community. The future of tech should also be accessible, flexible, and inclusive. This vision is the foundation of our We Power Tech program, which focuses on building a pool of technologists as diverse as our world. We know we have a long way to go before realizing this future. With our attention on gender diversity this International Women’s Day, we want to share what we can all do to address the workforce gender divide. A 2017 report by the National Center for Women and Information Technology reveals that women hold only 20% of computing jobs in the U.S. and that this number is declining, not increasing. In 2015, only 18% of Computer and Information Sciences bachelor’s degree recipients were women. Girls Who Code: Girls Who Code was founded with a single mission: to close the gender gap in technology. AWS has been working with Girls Who Code, supporting their Summer Immersion Program, a 7-week summer camp where 10-11th grade girls learn coding skills and get introduced to cloud technology. 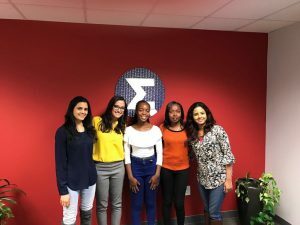 AWS worked with this growing population of future engineers by hosting an introduction to AWS course and workshop at four Girls Who Code summer camps in San Ramon, Washington D.C, and two New York City locations. Girls in Tech: Girls in Tech (GIT) is a global nonprofit organization focused on the engagement, education, and empowerment of girls and women who are passionate about technology. Globally, GIT has 100,000 members and 65 chapters located across six continents. GIT provides mentorship programs, coding bootcamps, social impact hackathons, design thinking workshops, and much more. Their programs are designed for women and girls at all stages of learning and STEM career journeys—from recent graduates and mid-career professionals to those considering re-entering the workforce. AWS, as part of our We Power Tech initiative, is collaborating with GIT to ensure all women have access to Science, Technology, Education, and Math (STEM) education resources and benefit from a supportive network of women leaders just like them. Learn more about GIT’s International Women’s Day campaign, highlighting women’s accomplishments in the workplace, and share your #ladybrags today and throughout the month of March. GIT is also taking their powerful Catalyst conference on the road this this year, to London, Melbourne and San Francisco. Join hundreds of women (and allies) to hear inspiring stories from leaders on diversity and inclusion from around the globe. 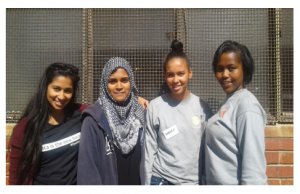 OpenUp: OpenUp is a nonprofit civic technology organization in South Africa dedicated to ensuring that all individuals have equal access to information. OpenUp advocates for transparency in government data and focuses on the role technology can play to promote collaboration between citizens and their governments. As part of OpenUp’s collaboration with Code for Cape Town, the two organizations designed a coding class for young women to cover the use of various open source tools. 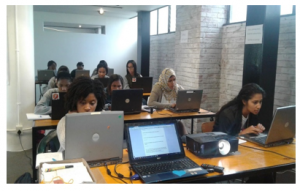 OpenUp facilitated an open data workshop for twelve high school girls from Cape Town. The curriculum covered the various sequential aspects of the Data Pipeline and conducted learners through the use of open source tools. Participants were taught to mine https://wazimap.co.za/ to gain insight into their communities using the census data. The training itself was in the form of a “Train the Trainer” model, enabling Code for Cape Town to facilitate the training independently going forward. OpenUp uses AWS services to power tools such as Wazimap, a useful tool in data literacy training, particularly for those who are new to data processing how to work with data outside of a database. Enquizit & Digital Divide Data: Digital Divide Data (DDD) is a social impact organization that delivers AWS cloud solutions and mission-driven projects for nonprofit organizations worldwide. DDD is training underserved Kenyan youth in technology skills to facilitate upward economic mobility and promote gender equality in the region. Enquizit took their efforts one step further when they brought two female graduates from the DDD Cloud Academy in Nairobi to Tysons, VA, to spend a week working on tasks and real-world projects for the company. While other large organizations and government agencies are hesitant to employ off-shore, remote-workers, Enquizit hopes to continue to work with organizations like DDD to acquire several talented graduates and onboard them in IT jobs. In addition to these featured nonprofits, we are also working with Lesbians Who Tech, Black Tech Women, Grace Hopper, and others to help bring more women into technology. Who are the women in your life that inspire you today? Consider donating to an organization today that promotes the education and empowerment of women and girls in their honor.